Adjustable and easy to use, the ISTEROMETRO® is a one-time use histerometer for uterine cavity depth measurement. Aromatic tip included. This sterile hysterometer CH10 has a soft distal part and a rigid handle. It has a 3.3 mm diameter and is disposable. Twenty-five units are available per box. It is used in getting uterine depth measurements. The single-use device is sterilized by Ethylene Oxide. It's stiff in polyethylene. Its distal part is supple and in polyethylene. Uterine Sounds are malleable, disposable, and ready to use for dilating and measuring the cervix. These disposable Uterine Sounds are latex-free and graduated in centimeters and with the marking from 3cm, 5cm, 7cm, 9cm and 11cm. 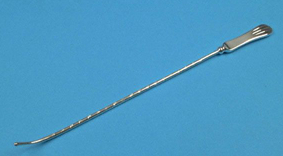 A slender flexible gauge with indicators which denote uterine depth prior to insertion of an intra-uterine device. The Pelican Uterine Sound is specifically shaped to aid insertion. A hysterometer is a gynecologic instrument capable of determining the dimensions, orientation and sensitivity of the uterus. Such measurements are useful for planning certain surgical procedures so as to avoid perforating the uterus. Thus, these devices are employed during hysteroscopies, the insertion of intrauterine devices, the transfer of embryos for in vitro fertilization and similar operations. The hysterometer is a flexible, graduated plastic tube. Some are straight, though curved models are less painful for the patient. Choice is primarily a function of flexibility. Patient comfort also should be considered.